Much like my Olympic spirit, this cake just didn't want to happen. I ran out of eggs, I couldn't find my recipe, I accidentally used dirty soapy dishes (but dry, so does it count if the soap is dry? Ugh. Don't tell me). I dropped pans, forgot ingredients, and generally functioned so below normal I was surprised I ended up with anything aside from a disastrously messy kitchen. Eventually I just sort of gave up and accepted my incompetence and figured at very least, whatever comes out of the oven can be washed down with my tears. But alls well that ends in cake. And, despite all the trouble, this one is delicious and light and not too sweet, but still decadent enough to satisfy all cravings. 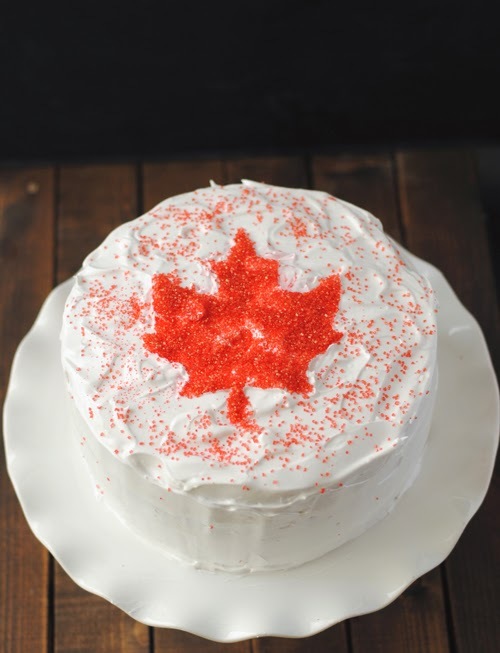 If you need a 4am treat to watch Canada (hopefully, maybe, and I dunno andwhowantstojixthings) bring home gold, this ombre red cake with seven minute frosting will do the trick and have you cheering for Team Canada all the way to the finish line. (Or some other metaphor that works for hockey). Preheat oven to 375F, and grease and flour four 9 inch round cake pans. (I used two pans, and just cleaned them between each batch). Combine the milk and buttermilk in a medium measuring jug. In a separate bowl, combine the flour, baking powder, and salt. Set all these things aside. In the bowl of a stand mixer, cream the butter and sugar until light and creamy. Beat in the eggs one at a time, and then add the vanilla. Beat in the flour mixture, alternative with the milk mixture, until everything is well combined. (But not too combined. No flour chunkies, but don't go overboard). Separate the batter into four separate bowls. If you're running out of bowls, just use the ones you used to combine the flour and stuff. 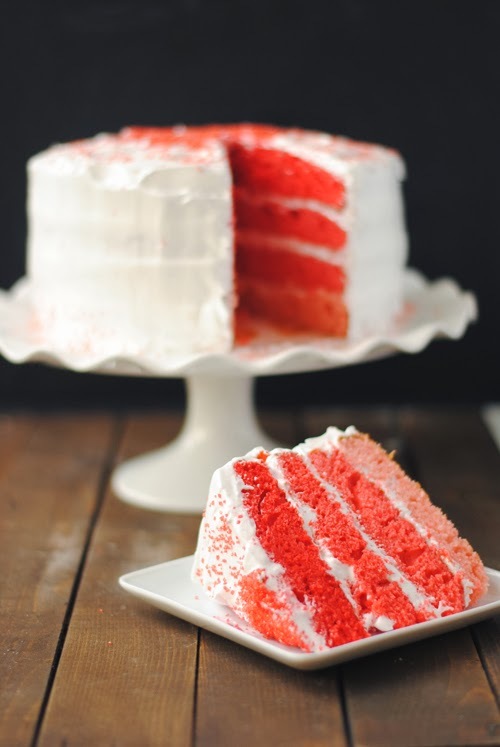 Use the red food colouring sparingly to colour each batch, ranging from a lighter pink to a vibrant red. Spoon the batter into the cake pans and bake for 18-25 minutes. Allow to cool on wire racks. *note that this was just enough icing to cover my cake and give a thin bit between layers. If you want a thicker layer, double the recipe. Combine all ingredients in the top of a double boiler. Stir frequently while heating over simmering water until everything reaches 160F. (Nothing ruins the taste of a cake like salmonella poisoning. Trust me. I have stories and they involve things coming out of places at great force). Transfer the mixture to the bowl of a very clean stand mixer, and whip on high until stiff peaks form. This takes about 6-8 minutes, but watch it closely. To assemble the cake, spread a thin layer of icing between each layer, stacking carefully. Plop a bunch on top, and carefully drag it down to ice the sides. Use a cut out stencil or a cookie cutter and place it gently on top of the cake. Fill the design with red coloured sugar sprinkles, and sprinkle a few more around the top and sides. Voila! Team spirit you can eat!